South African government officials have attacked Russia’s bid to supply South Africa’s new nuclear reactor programme, accusing Rosatom, the state nuclear power agency, of imposing financially and legally disadvantageous terms which the South Africans, speaking anonymously, term “scary”. The attack was launched Friday in the Mail & Guardian, a local newspaper associated with the Guardian of London. 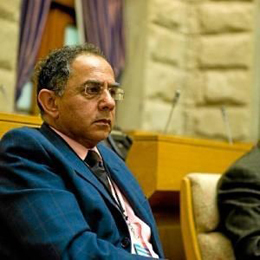 Just one SA Government official, Enver Daniels, the chief state law advisor in Pretoria, was identified as behind the allegations. Speaking anonymously to the newspaper also was a group identified as “numerous”, and representing the SA ministries of energy, international relations, trade and industry, and the treasury. 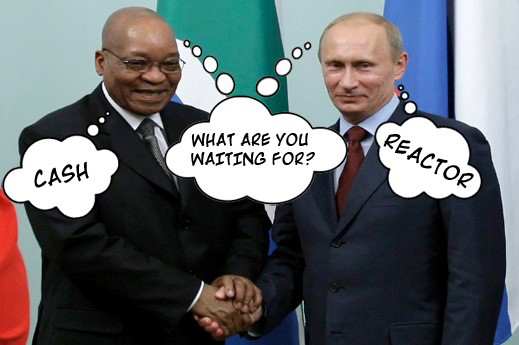 The SA officials launched their attack on Rosatom after the full text of the Rosatom agreement on nuclear cooperation with South Africa was discovered openly published on a Russian Foreign Ministry website. The SA Government continues to keep the text of the Rosatom agreement classified. The accusing officials are also familiar with the terms of rival nuclear cooperation agreements signed with the French state company Areva, and with the Chinese government, in collaboration with the US. The SA officials are keeping silent on the terms of these pacts, and on a lobbying campaign by the US and France to drive the Russians out of the running for the $50 billion contract, the largest state procurement in SA history. 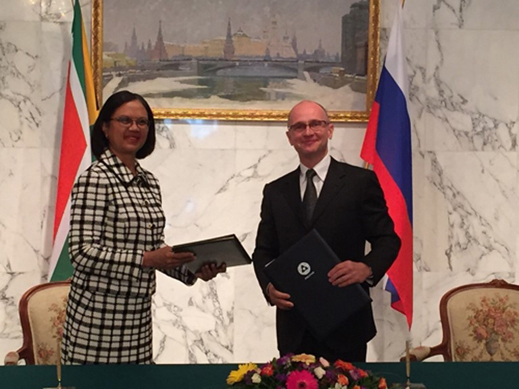 The Russian-language agreement was signed by Rosatom director-general Sergey Kirienko (below right) and South Africa’s Energy Minister Tina Joemat-Pettersson (left) on September 22 in Vienna last year, during a conference of the International Atomic Energy Agency. The Foreign Ministry text can be read here. The document is dated September 21, but it is unclear when it was posted by the Foreign Ministry. An unofficial English translation can be read here. The Mail & Guardian reported the press release, adding that a request had been filed by an anti-nuclear power group for disclosure of the full agreement. The request has subsequently been refused by the government in Pretoria. The Mail & Guardian did not report the Paris agreement when it was signed. The paper’s reporters have not questioned Ollivier or Areva about the exclusivity and liability provisions of the French agreement. For details of the Chinese cooperation agreement, signed in March 2014 by a low-level Beijing official, Tan Rong Yao of the China National Energy Administration, read this. Headlined “how we got the secret document”, the Mail & Guardian reporters say they did not learn the full text of the Rosatom agreement had been published until a few days before their report last week. 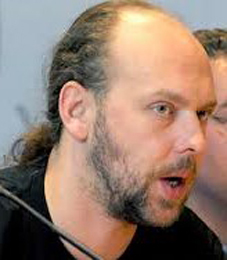 The journalists would have missed it entirely if they had not been tipped off by Vladimir Slivyak, a Russia-based, US-educated analyst of nuclear and other energy issues for the EcoDefence group. Slivyak said he had not seen the Rosatom agreement until a “friend” tipped him off about the website publication late in January. According to Slivyak (right), “I began to study the issue of [SA-Russia nuclear] cooperation in November, when we met at a conference with colleagues from South Africa and I was interested in it. Until the end of last year I had searched for this agreement on the internet I could not find anything. This year, in January, a friend of mine who works in the Ministry of Foreign Affairs sent me this text.” Slivyak said he then sent the website link of the Rosatom agreement to his colleagues at the Johannesburg-based organization, Earth Life. The Mail & Guardian was informed a few days into this month. A notation — НЕ ДЕЙСТВУЕТ — at the top of the Rosatom agreement indicates that the pact has not been ratified by the Russian or SA parliaments, and is thus not yet in force. A review of the Foreign Ministry website reveals public texts of recent Russian nuclear cooperation agreements with Hungary, Finland, Croatia, Armenia, and Belarus. The Mail & Guardian reporters have not compared these with the SA agreement. Daniels (right), the state legal adviser who has been reported as one of the sources of the Mail & Guardian’s interpretation of the Russian agreement, has been under attack himself in SA. He has been accused of incompetent legal advice, negligence, and racial prejudice. “Daniels and his cohorts have not been at the top of their game for a long while, if ever,” reported The Daily Maverick, an investigative journalism website from Johannesburg in 2012. 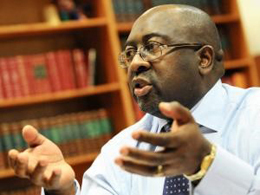 The Mail & Guardian has also criticized Daniels for “poor judgement” and for failing to “deliver value for money”. Rosatom says it cannot respond to Daniels or to the anonymous allegations because its hands have been tied by the SA Government. A Rosatom spokesman in Johannesburg, Ryan Collyer, claims that Rosatom is waiting on the Energy Department to frame a joint response to questions about the agreement. Moscow sources say Rosatom is well aware that the US and French governments have been lobbying to discredit the Russian bid. Their activities have intensified since the start of the Ukraine war last March and the US and European Union sanctions. According to Rosatom chief Kirienko, on March 27, 2014, “ some international contracts of Rosatom may fall under restrictions due to possible economic sanctions of the West…Taking into account a number of comments about the possible limitations of economic relations, we understand that some of the [international] contracts may be under political constraints.” Last June, Tenex, the enriched fuel export unit of the Rosatom group, issued an explicit statement that sanctions were not interfering with or restricting its business. To date, no individual or corporate unit of the Rosatom group has been designated on any of the sanctions lists issued by the US, Canada, the European Union, Switzerland, or other countries. For the full sanctions list, updated to December 23, 2014, see: http://www.riskadvisory.net. No individual management executive of the Rosatom group has been sanctioned. 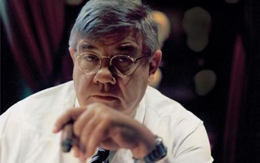 In addition to Kirienko, the Rosatom Supervisory Board currently comprises: Boris Gryzlov (National Security Council), Igor Borovkov (Prime Ministry), Larissa Brychyova (Legal Adviser to President), Andrei Klepach (Rosatom chief economist), Alexander Novak (Minister of Energy), Yury Trutnev (Deputy Prime Minister), and Yury Yakovlev (Federal Security Service). Only one, Gryzlov, a former parliament speaker and member of the Security Council, has been sanctioned. For the involvement of President Jacob Zuma and other SA officials in the Russian negotiations over the past two years, open this archive. SA sources report growing concern in Pretoria that alleged corruption in Zuma’s circle has encouraged the Kremlin to favour the development of its relationship with President Robert Mugabe and candidate successors in Zimbabwe. For Russia’s planned investment in Zimbabwe, and the proposed build-up of a rival to South Africa’s military forces, read this. Asked to clarify the timing of the procurement process, Polikarpov (right) added: “Unfortunately at this time it would be extremely difficult for us to put a time line on the procurement process, as this will be laid out by the South African government. We can say that we will be ready and willing to participate in the procurement process when it commences.” Yesterday Polikarpov refused to respond to the red scare claims. 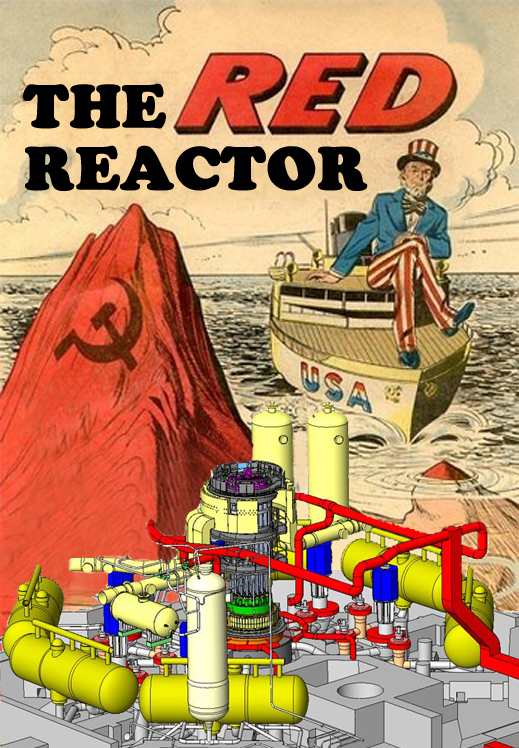 One of the sources says that all three agreements – Russian, French, and Sino-American – attempt to influence the tender phase for the reactor purchase in favour of each country’s proprietary technology. The Russian agreement isn’t different on that score, the source claims, except that it isn’t secret. In the published text, Rosatom concedes that the SA Government is free to decide to build 2 Russian technology reactors (2.4GW capacity), and to reserve its decision on what technology to buy for the remaining reactors (7.2GW). The convention was first adopted in 1977. It was accepted by the Russian Federation in 1996 and ratified in 2005. South Africa has refused to do either. Normal practice in the international nuclear industry, and in the insurance of reactors, is to restrict liability to operators, not suppliers. For an assessment of the principles and remedies of the Vienna Convention and international practice, read this. At present, South Africa is one of the few nuclear-power states to accept no nuclear incident liability convention; the others, as the tabulation illustrates, are China, Iran, Pakistan, Taiwan, and Korea. CSC = Convention on Supplementary Compensation for Nuclear Damage (CSC). Not yet in force. * India has signed the CSC but has not yet ratified it, and it is not yet clear whether their domestic liability law conforms with the requirements of the convention. According to an industry expert, “the press coverage in South Africa blames Rosatom for following the international practice, without knowing that the French and Chinese agreements are likely to say much the same thing. 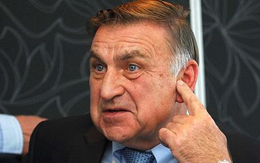 It puts the blame on the Russians when it is South African practice which is at variance with the international practice.” Rosatom’s nuclear cooperation agreements with Hungary in January 2014 and Finland in February 2014, also published on the Foreign Ministry website, expressly provide for liability according to the international conventions which those countries have adopted. The Mail & Guardian acknowledges it doesn’t know why the South African Government has refused to ratify the international conventions, or what difference this would make to the Rosatom provision for liability.